Is it fair to assume that all the posters on this thread are talking about fantasy and not real life? Do you think the sky is the limit for his fantasy ranking? I just think there is a massive difference between the two (real life vs. fantasy) and this is a fantasy related forum. The difference is enormous between the two. Steals and blocks are so incredibly important for fantasy. It is tough to crack the upper tier of fantasy without stocks or being an elite scorer. I have zero idea of Europe to NBA steals projections, but I have not heard much about Luka's stock upside. I guess my point on the hype and maybe why I am not on it here is that the upside into the 40 range only gets realized with stocks....or the easiest and most likely path to 40 upside this year is with stocks. I think this thread is beyond the point of Luka getting minutes or being a serviceable real life option for the Mavs. So switching to fantasy, if the range for Luka is 40-110ish, how do you feel about him costing you a pick in the 50-65 range? Just from looking at friend's draft boards in various leagues (for money), that is his range. In dyansty (for money) he went 20. The draft capital cost will probably increase as the season approaches. Its funny you're implying he's not being realistic in a fantasy forum. You mean, let me understand this cause, ya know maybe it's me, I'm a little f*cked up maybe, but I'm funny how, I mean funny like I'm a clown, I amuse you? I make you laugh, I'm here to f*ckin' amuse you? Easy, Joe. Let's save fighting for real stuff. I may be wrong, but I believe it was just a joke. Indeed. Hence the "Joe" reference. Yea, most definitely a joke. Maybe 5-10 years ago I would say the fantasy community was laughed at, but these days there are millions of people that enjoy fantasy sports and thousands that use it to try and add to their incomes. We are all posting on a fantasy forum. I think this place is great because there are some really insightful people and I try to learn from them. In this case, Luka is going to be one of those "Lonzo" types where people are strongly opinionated. Time will tell, just like it did with Lonzo. Personally, the lines seem blurry between Luka being good in life and fantasy. But I guess that can be funny to some and that is cool. I would always rather have someone laugh with me or at me than rile them up. Well Jose Calderon was top 50 at one point so lack of elite athleticism or an American basketball background didn't hurt him. Luka is way bigger and stronger than him, more talented and has better court vision. I think people forget that the mind is the most important weapon on the court. True, but there is also the consistent trend of rookies in the NBA not producing in relation to the hype they get. It is to be seen which trend wins out. There hasn't been such an accomplished rookie in the NBA, euro defenses are much much much better than the majority of nba teams. He will be great, i can t imagine a better coach, except Pop, for him coming in. Not worth his current ranking but he will be great in 2 seasons. Luka's game is really fantasy friendly though. If he is gonna be good in real life it will definitely be on fantasy as well. Maybe he will be even better in fantasy than real life to be honest. The way Jokic is better in fantasy than real life. Has anyone compared Luka to Toni Kucoc? I wouldn't say euro defenses are "much much" better. I'd say the NBA defenses are much better than they look they are. As for Doncic's hype - yes, I'm a bit on it. Unfortunately not to the point where I could think of getting him in any of my drafts. Because with rookies there's always some kind of hype and there's always some kind of risk attached. And in every league happens to be a manager who doesn't care of analysis such the fb-ninja's article about rookies in fantasy. And such players are drafted around their ceilings or even higher. True but he's not really a rookie. He's been playing pro for years and has shown he can put up numbers against NBA players. For the record, I won't be taking him in re-draft but I did take him in Dynasty after lucking into a high pick from an old trade. Doncic forum is very active but I have not found opinions in what round to draft him? I can say from my part: not earlier than 7th. Of course in redraft leagues H2H 9 cat. I did. I picked number one. It's a "cool story bro" but the pick didn't cost much and was a very tough choice. The appeal of Doncic is that his game fits the modern NBA perfectly and his mind makes him a safe long term option even if he only lived up to his floor. He's come along at the perfect time given his particular strengths. In redraft the hype is deafening and so he may not be a high value pick in that setting. I did. I picked number one. It's a "cool story bro" but the pick didn't cost much and was a very tough choice. As apatas wrote - 7th round is high enough. Maybe even too high for me in Doncic's case. NBA rookies are NBA rookies. Bogdan, Rubio, Milos, Manu, Rudy Fernandez all had years of professional experience and still had to adjust to playing in the NBA. I'm not saying he won't be great, but historically there is a steep learning curve even for players who have international professional experience under their belt. At yahoo he's listed at PG, sounds like he's playing SF/PF so he'll get those positions added and for redraft I like that type of swiss army knife. Would he fit into any specific build(s)? NBA rookie. Not a rookie to professional basketball. It feels like with Ayton people are chasing something he won't be unless he defies statics and historical data. 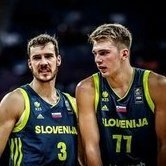 With Doncic people are getting in on something unique and so there is perceived risk because he's different.